The evolution of our infection-fighting systems may have something to teach modern scientists. That's what a group from the University of Granada in Spain found when they studied a protein that's been around for over four billion years. Their work, by senior author José Sánchez-Ruiz and colleagues in the Department of Physical Chemistry, was published in the journal Cell Reports. All the proteins made by our body start as blueprints in our genes. Our genetic information is coded in our DNA. The genetic sequences there get transcribed (read and processed) into RNA, which then translates the genetic information into amino acids that group together to form proteins. Unique genetic sequences create all the proteins every living organism needs to run the metabolic processes in every cell. Professor Sánchez-Ruiz and his team reconstruct ancient gene sequences that our ancestors used to produce proteins. Living organisms haven't produced these proteins for billions of years, so to figure out what they would have looked like, the researchers compare genes from evolutionarily related organisms and make their best estimation of the ancient genetic sequence, then analyze the proteins they would have produced. One protein, called thioredoxin, is a researcher favorite, because it participates in many chemical reactions within cells, but more importantly because it has been around almost since the origin of life and it is present in all modern organisms. It's so ancient that both humans and bacteria like E. coli depend on it to live. And now, researchers have found that primitive thioredoxin played an important, but different role, than the modern thioredoxin in viral infections. When a virus called a bacteriophage infects a bacterial cell, it binds to the cell, injects its genetic info into the bacteria, and uses the cell's own copying mechanisms to make duplicates of itself. Once the virus replicates, it bursts from the bacteria, killing the cell and releasing more viruses, which can then go on to infect other cells. Thioredoxin is one of the proteins that these viruses use to replicate in the bacterial cell. 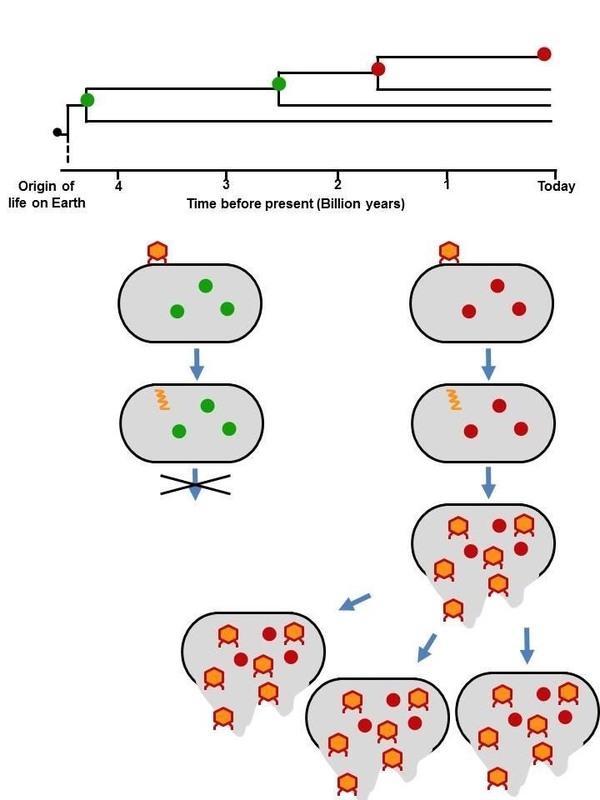 Based on ancient genetic sequences, the research team recreated seven primitive thioredoxins that they surmised existed from one and a half to four billion years ago, then put these different thioredoxins into E. coli to see how they would function. The researchers knew that thioredoxin is required for E. coli cells to live, but when they put the primitive thioredoxin — created in the lab — into E. coli, something unexpected happened. Bacteria with the primitive thioredoxin could perform their normal functions — functions that required thioredoxin — as usual, but they were resistant to viral infections. Asunción Delgado, a former postdoctoral student at the University of Granada, found that the bacteriophage viruses were unable to use the primitive thioredoxin to replicate, giving the bacteria a one-up in the fight against infection. Unlike in a cell with a modern version of thioredoxin, the infection was stopped because the virus could not multiply within the bacteria with primitive thioredoxins since they were likely adapted to work with the newer version of the protein. The researchers suggested that dual evolutionary pathways could be at work here; The thioredoxin has changed over 4 billion years and, likely, so has the virus. The virus may have changed so much over those 4 billion years that it can no longer use the ancient thioredoxin protein to reproduce in the bacterial cell. As fascinating as this finding is, the scientists believe it also has untapped utility. "Some people think that evolution is just a theory or is just some kind of philosophic explanation," said Sánchez-Ruiz in a Cell Press release. "Evolutionary studies have practical applications." These researchers envision a use for ancestral proteins as protection against crop-killing viruses. Most viruses that kill people don't cause diseases in humans — they kill off crops, bringing famine and starvation. If ancient, infection-stopping genes could be edited into plants, they could potentially have a new weapon to defend themselves against modern viruses. By looking back at proteins that may have changed through evolution, and combining that information with new technology and tools, like genetic engineering, we may come up with a winning combination that will apply old solutions to address new problems. News: So What Are the Odds That There Is Alien Life?